DEARBORN, Mich., Feb. 25, 2016 – Ford is using mobile climate and road simulators to minimize squeaks and rattles in the all-new 2017 F-Series Super Duty – the toughest, smartest, most capable Super Duty ever. Rigorous testing with this equipment includes some of the most extreme conditions imaginable. The simulators are known as Transportable Environmental Four Posters, in reference to their 18-wheeler portability and four-point road simulators that sit under each wheel when a vehicle is in the chamber. Ford is the only automaker to use these mobile simulators. 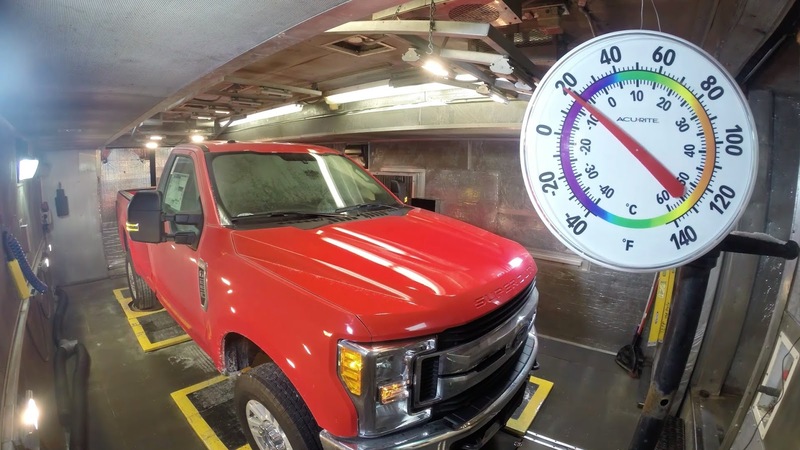 In these mobile labs, Ford puts prototype vehicles through their paces on all manner of simulated terrain and road surfaces, as well as in extreme humidity and temperatures ranging from a bone-chilling 20 degrees below zero to a blistering 120 degrees Fahrenheit. Thanks to the portability of these simulators, Ford can move them all over the world to test prototypes wherever and whenever a vehicle is undergoing development. To test the all-new Super Duty, Ford moved one of the simulators to Kentucky Truck Plant, which has produced more than 5 million Super Duty trucks since the vehicle was introduced in 1999. Before the first all-new Super Duty charges off the line, it will have logged more than 12 million cumulative miles of testing – more than any of its predecessors – to ensure the promise of Built Ford Tough. These initially patented mobile climate and road simulators help Ford ensure quality in a way that’s as unique as it is innovative. The ability to perform tests on-site at Ford facilities is immensely more efficient than sending a vehicle to another location and waiting for results. Prototypes undergo testing all the way to production, with the controlled environment allowing trained experts and advanced audio-sensing equipment to identify the causes of noise. For each vehicle launch, climate and road simulation testing is overseen by a Ford launch engineer and a plant vehicle team engineer who work diligently to prevent squeaks and rattles; for Super Duty, this was Abdul Mohammed and Dave Massengill, respectively. This testing is part of the company’s focus on quiet quality – a motto boldly emblazoned on each of the eight simulators as a reminder. Ford worked with suppliers and other companies to develop the Transportable Environmental Four Posters, which have now been used for more than 100 global vehicle launches. Aside from full-vehicle testing, Ford also performs component-level testing to help limit squeaks and rattles. For instance, the company subjects instrument panels to shake testing on custom stands called Transportable Instrument Panel Sound Testing Evaluation Rigs. Mobile climate and road simulators are but one part of a large suite of tools Ford uses to create high-quality vehicles.